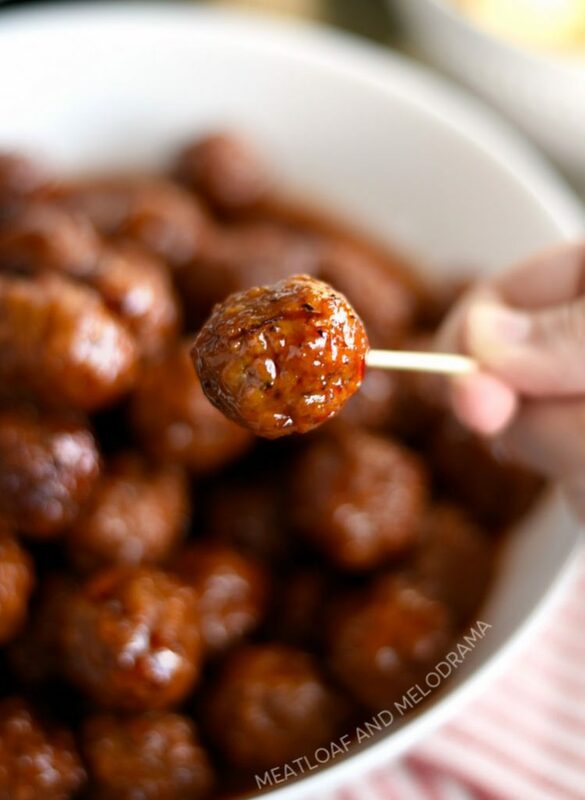 Instant Pot Grape Jelly Meatballs made with sweet chili sauce and grape jelly are perfect for a quick and easy appetizer recipe for parties or game day! We were watching the playoffs the other day, and I made a bunch of Instant Pot appetizers to munch on. Seriously, all of the appetizers were Instant Pot recipes, including these easy 3 ingredient Instant Pot grape jelly meatballs. Good times! 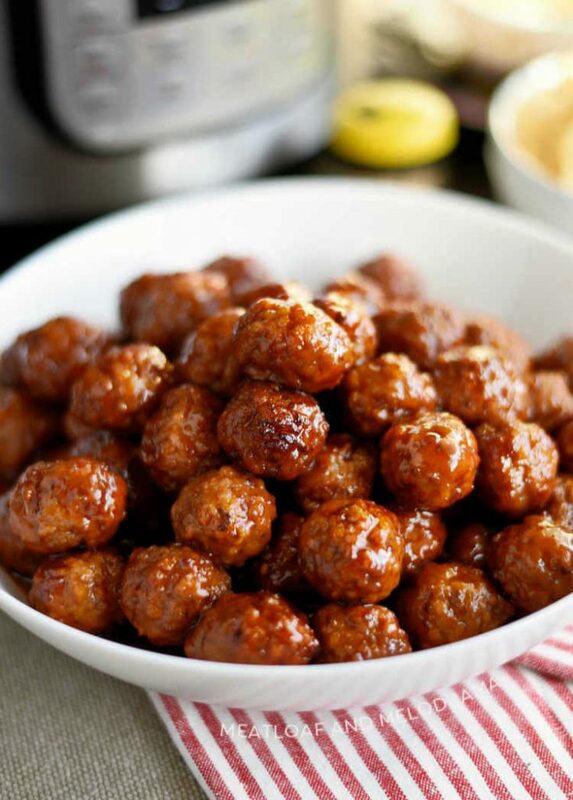 These little appetizer meatballs have been around forever. Chances are, you’ve probably had slow cooker grape jelly meatballs made with Heinz sweet chili sauce or bbq sauce at a party or potluck. But these sweet and spicy Instant Pot meatballs are so much faster to make, and they taste just as good as the slow cooker version. You can use frozen meatballs for this recipe, or you can make your own. As much as I love homemade cocktail party meatballs, I took the easy route this time. I had some Instant Pot queso dip and pineapple teriyaki chicken wings cooking, so it was frozen meatballs to the rescue! 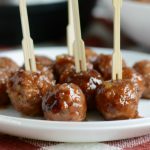 How do you make meatballs with grape jelly in the Instant Pot? I like to add a little oil to the bottom of the pot whenever I make Instant Pot meatballs. Then, you add the meatballs, water, grape jelly and sweet chili sauce. I only used a little over a cup of jelly here to cut down on the sweetness, but you can always add more if you want. You can also add a pinch of hot pepper flakes for added spice. 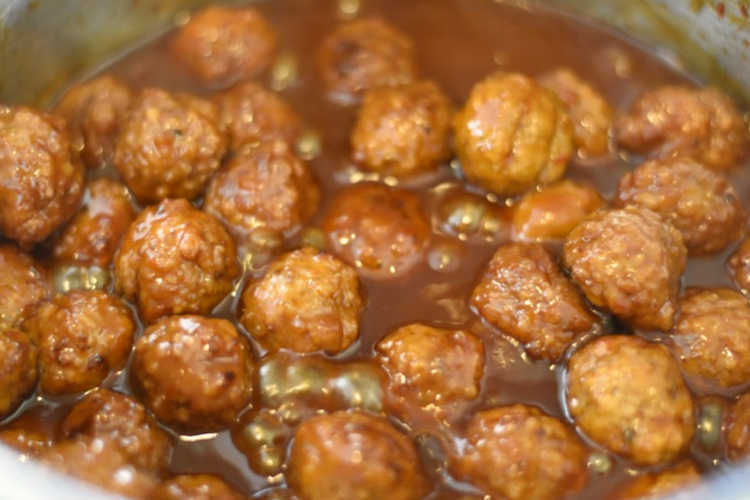 How long do you cook meatballs in the Instant Pot? 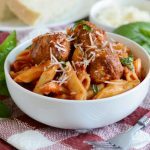 Both fresh and frozen meatballs take just 5 minutes to cook in the Instant Pot. 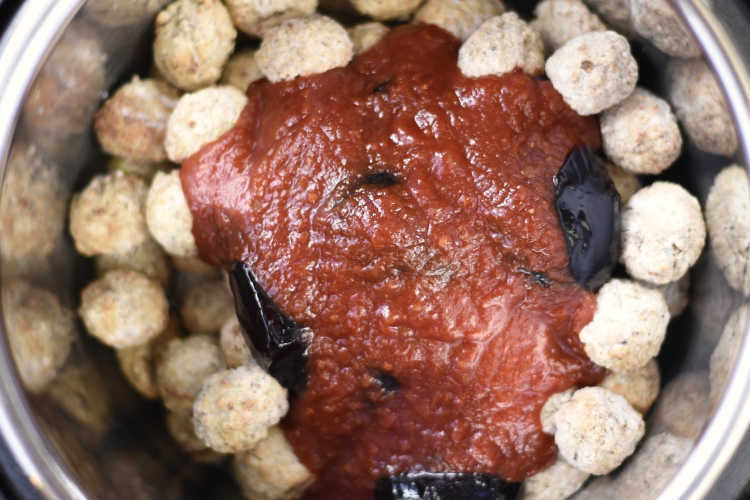 If you want to make your own meatballs, I recommend browning them first. After the meatballs are done, you can hit the Saute button to reduce the sauce. You can leave the meatballs on the Keep Warm setting until you’re ready to serve them — just like with a slow cooker. Or, you can add the meatballs to a serving bowl and pour the sauce over them. The sauce will thicken as it cools. And that’s it, folks! You’ve just made a batch of sweet and spicy meatballs in the pressure cooker in about 30 minutes! What do you serve with grape jelly meatballs? For appetizer meatballs, serve them on their own. You can also serve them over pasta or rice for an easy main dish. When pot beeps, do a quick release. When pin drops, open lid, and stir meatballs well. 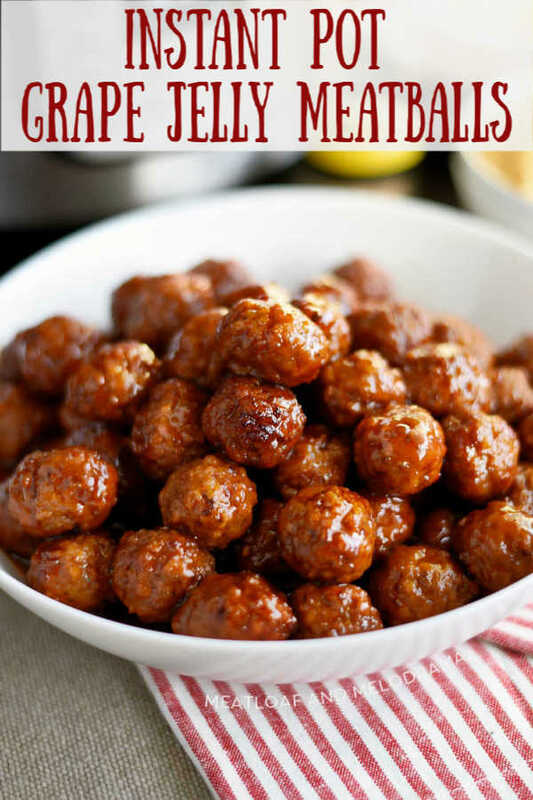 I hope you enjoy these quick and easy grape jelly meatballs as much as we do! I followed the recipe and they turned out great! Thank you for the recipe. YUM! This looks so yummy! I would love to try this recipe. I am definitely a meatball and jelly person :)! Sounds so yummy and perfect! I really love quick and easy recipes like this, absolutely a must try! 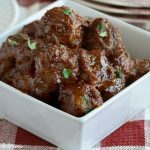 I make these in the slow cooker all the time but have never tried the instant pot! I’ll have to try it out! 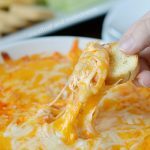 This is a great instant pot recipes to save for the Super Bowl! 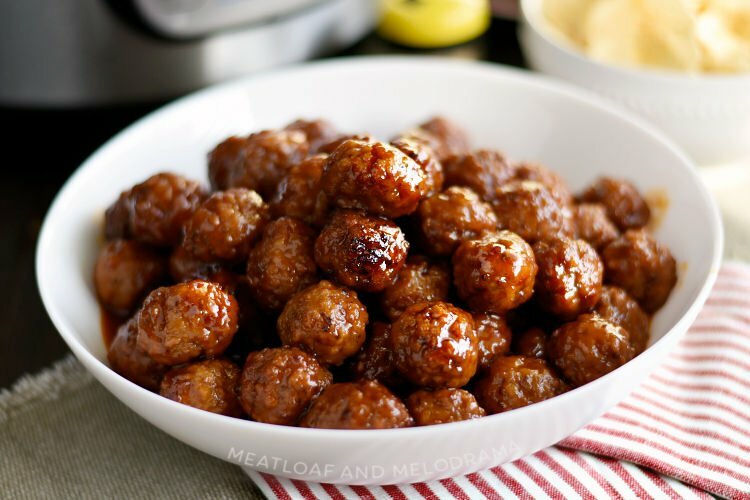 These meatballs are a great party appetizer! I love that I can make them in my IP! We love those grape jelly meatballs. I can’t wait to try them out in my Instant Pot! I’ve never had a meatball like this, but it sounds intriguing!The addition of grape jelly makes me think fondly of a family recipe that used grape jelly as well. 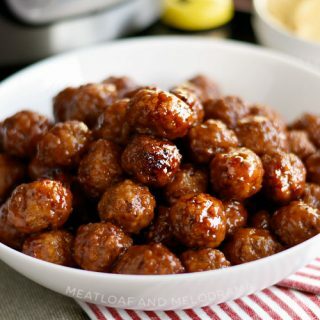 I bet these meatballs would be a fan favorite at any gameday party! We made them again, and they really are perfect for gameday. Thanks, Mary! Made these for the games yesterday. What a hit! So happy to hear this, James. Glad you liked it! 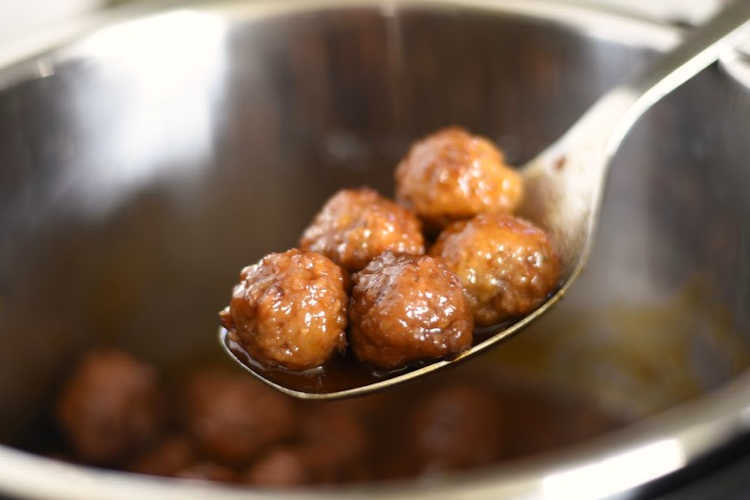 Your Instant Pot Grape Jelly Meatballs will be a great addition to any big game day. I look forward to trying these, pinning the recipe. Hope you are having a great week and staying warm. Thanks so much for sharing with us at Full Plate Thursday and come back soon!